I have loved Allie Brosh's blog ever since I was first introduced to Dogs Don't Understand Basic Concepts Like Moving. Her quirky illustrated blogs have made me burst out laughing and at times sob quietly to my computer "I know exactly how you feel". Now a selection of her past favorites along with new adventures are available in a beautiful, colorful paperback book. 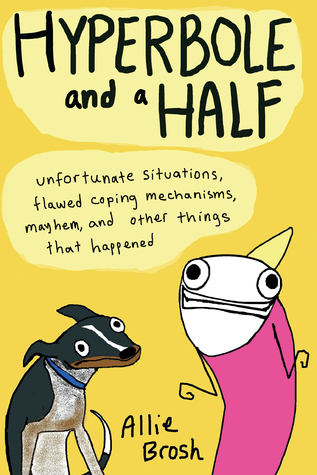 Check out Hyperbole and a Half and pick up a copy of Allie's new book. I wish this review could be as witty, insightful, and quirky as one of Allie's blogs, but that is why she is a blogger with a newly published book and I am most certainly not. Recommended for people who love humor blogs and anyone who enjoyed the Customer Reviews for Haribo Gummy Candy, Sugarless Gummy Bears . Sign into Goodreads to see if any of your friends have read Hyperbole and a Half.